Some historians believe that the word “raouché” derives from the Aramaic word roshor or Arabic word ras, both meaning head. Other historians argue that it is a corruption of the French word roche (rocher), meaning rock. The shores near Raouché have yielded the area’s oldest evidence of human existence, flints and basic stone tools are displayed in the AUB Archaeological Museum. There is nothing that is more Beirut to me then those 2 rocks standing face to face, solitary and proud. They remind me of the city and its people. We, like those two beautiful rocks, are built up over many years, influenced by our surroundings as we weather and erode depending on the conditions we are subjected to and the trials that we are put through. Compressed by the weight of heavy loads, we can be weighed down by our heavy hearts and yet stand tall, proud, and robust. We are made up of many sediments. We are the composition of everyone whom we’ve met, and their impact on our lives. Some people and events leave larger pieces of sediment, while some are smaller than a tiny grain of sand and they make us who we are today. These rocks are the physical imprints of the earth, because everyone and everything affects something in one way or the other. They remind us that we are part of a bigger picture, a series of rocks that make up part of human history. They stand there unchanged dabbling their feet in the water, a silent reflection of this busy city. I can see behind those rocks, beyond their solid facade. They might beat scissors, in a child’s hand game, but we should remember that we can be paper, and with a piece of paper we can maintain them as the city’s gatekeepers or destroy them. They are fragile and powerless at times, as proud and resilient as they look. 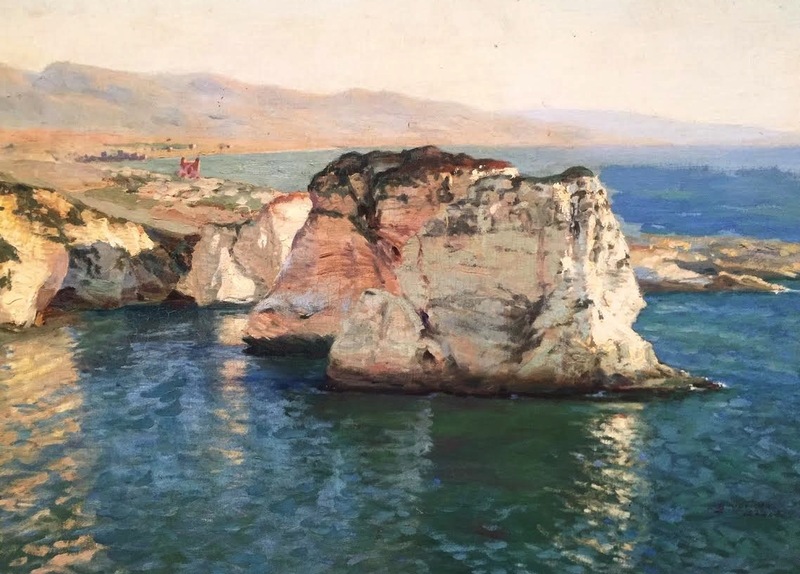 The oil painting that I posted is currently displayed at the Sursock Museum by Boris Novicov called La grotte aux pigeons (1926).